Be sure to save your progress along the way! After you've signed up with a new eHungry account, the first step to setting up your online ordering site is to create a location. Once you have created a location it is time to set it up. In your Online Ordering Console, you can set up your restaurant locations by selecting "Restaurant Manager" from the main menu, and then selecting "Restaurant Locations" under the "RESTAURANT SETTINGS" heading. If you need to change or update any basic information about your location click Change This next to you Current Contact Info for this Location. Here you can edit your basic information for the selected location. Be sure to click Save Changes when you are done! You will need to reload the page to see the changes you made. 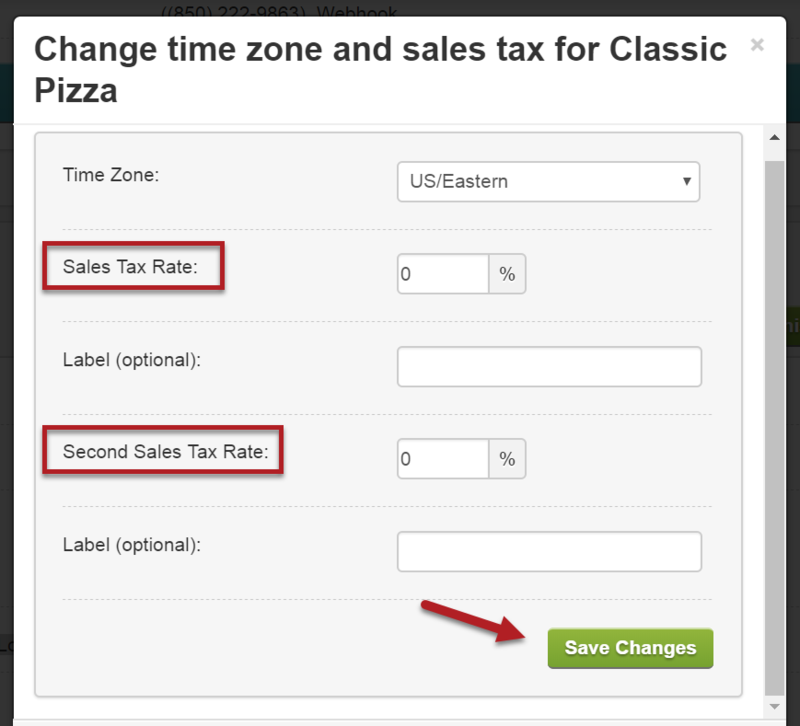 To set your Time Zone and Tax Rate click Change This next to you Current Time Zone and Tax Rate for this Location. Here you can find and select your time zone from the drop down. You may notice two spaces for sales tax, you only need to fill in one but depending where you are located it may be helpful to separate out State/Province and City rates. Be sure to click Save Changes when you are done! Reload the browser page to see the changes right away. The rest of the settings are under Edit/View Additional Details for this Location. Below you can set what your online ordering is available for (Delivery/Dine-In/Pick-Up), whether your menu is live and visible to customers or not, and your payment options. First, you will come to the option to select what you would like your online ordering to be available for, Delivery, Dine-In, and/or Pick-Up. Below, you can select yes if you would like customers to be prompted with the option to add a tip when they are checking out online. Usually customers choose which menu they want to look at, even if that menu is not available at that time. If you select yes for the area in red below, the system will automatically select the appropriate menu for the time of day. The system would select the "Menu Time" (ie: Breakfast, Lunch, Dinner) according to the availability set for each menu time. 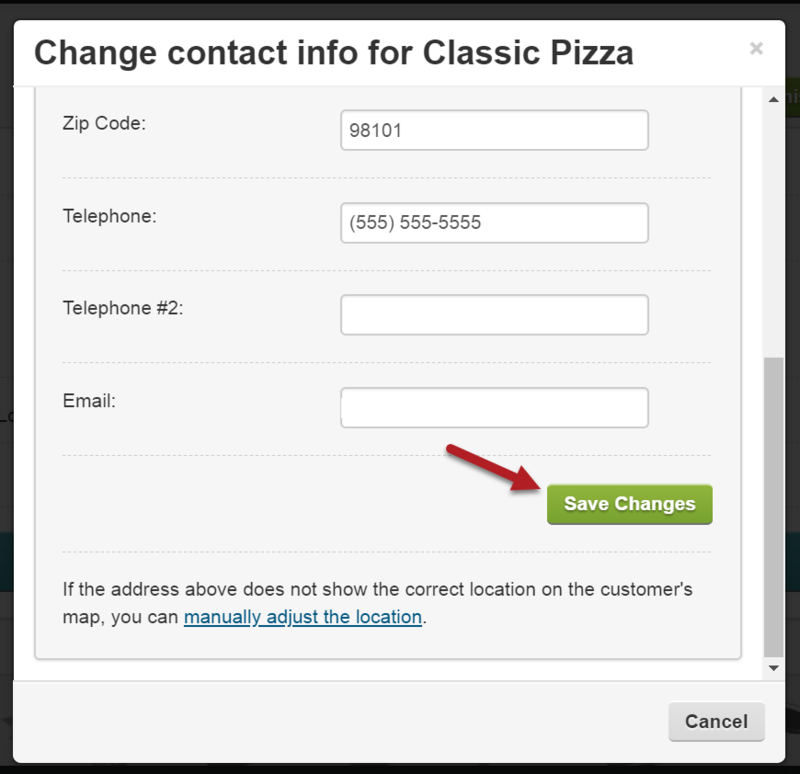 By default, customers can mix and match menu items from any menus available at the time they are ordering for. If you want to limit customers to create orders from only one menu, select yes for the option below. Ex: Customers who add items to their cart from the breakfast menu could NOT also add items from the lunch menu, even if both are available at the same time. Here you select which payment options you would like to accept, and under which circumstances! Once you select your first option, more specifics appear. You can also offer customers the option to pay by a house account, as seen below. This does require a special manual setup, please view the article "How to Setup a House Account". If you offer a payment type not already covered, click Add A Custom Payment Type to set it up. Here you can enter a display name for your custom payment type. Select this box if you would like to prompt the customer to enter a credit card or account number. Select this box if you would like to make the credit card or account number a mandatory field. Finally you can select which order types you would like this custom payment type available for! Be sure to click Save This Information when you are done. Here you can select which types of credit cards you want to accept. You can also opt to add an additional fee for orders payed for with a credit card. Either a percentage or a flat rate will do! You can also always leave it blank if you don't want to have an additional fee. Select the box below if you do not accept credit cards at the time of delivery. If selected above, customers will still be able to pay for delivery orders before hand with a credit card, just not at the door. And finally, here are a few additional options available. If you are manually processing credit cards it may be necessary to get the CVV for the credit cards from your customers. If that is the case, select this box. A zip code is always required to credit cards, but you can also select this box to require a full address. Here you can set your hours for each day including multiple sets per day and different hours for Delivery vs Dine-In/Pickup. Here you can set your available hours for each day. 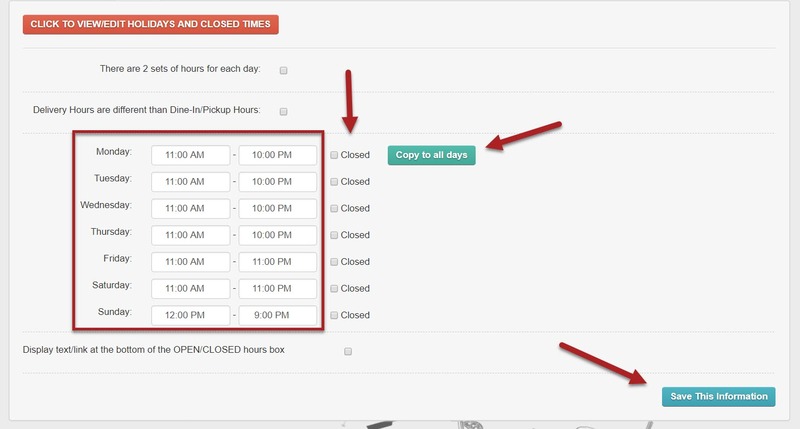 If you are closed certain days simply click the closed box next to those days. Note: If you have similar hours most days you can enter the hours in the Monday slot and click Copy to all Days for faster entry! Be sure to click Save This Information when you are done! Click the box next to There are 2 sets of hours for each day and a second set of boxes will appear for you to enter your hours into. This is useful if you are closed for a few hours in the middle of the day. Click Save This Information when you are done! 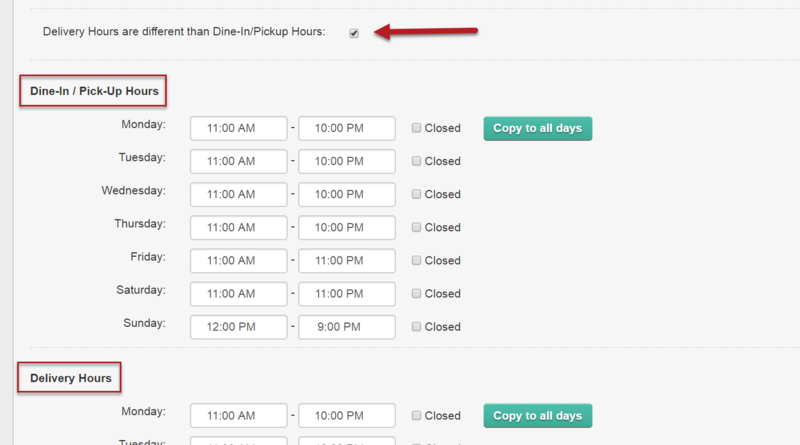 Click the box next to Delivery Hours are different that Dine-In/Pick-Up Hours. This will open a new set of hours so you can enter different hours that you are available for delivery vs. people coming to your location for pick-up or to dine-in. Note that you can have both! If you check both boxes you can have two sets of hours for both the Delivery and the Dine-In/Pick-Up options. 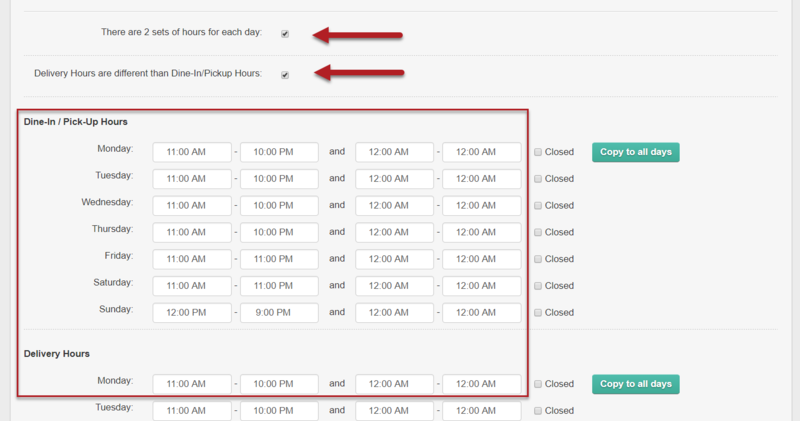 You can enter text and a URL to appear below where your hours are listed. Here you can choose how you are notified when orders come in. Also known as "Order Prep Times" or "Prep Times"
Here you can enter the time required for you to prepare orders and settings related to orders placed in advance. Checking the box below will make sure all prep times would be completed during hours when you are open. So customers couldn't order food to be ready as soon as you open, but rather after you open plus the prep time you entered above. By default orders will not go through if the prep time would take the order past the time you close. 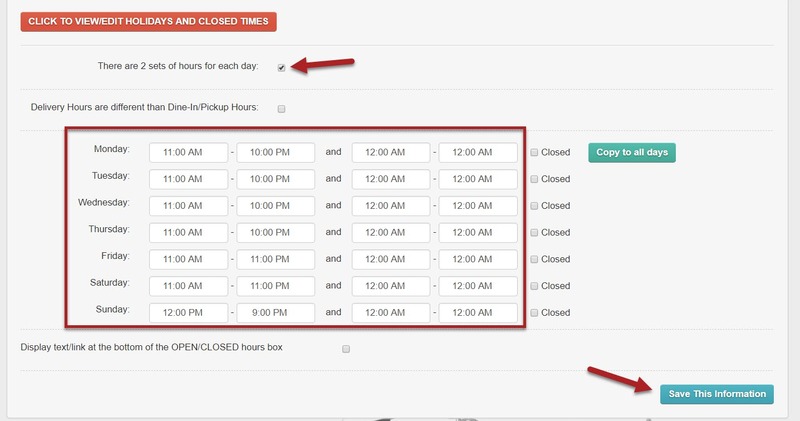 Check this box to allow orders to be placed right up until closing time, even if this means an order could be ready after you are technically closed. Below you can choose to allow ONLY ASAP ("As Soon as Possible") orders, so no orders can be placed for future dates or times. You can enter the maximum number of days in advance that a customer can order for. You can also set it to not show a time for ASAP orders. The time of advance orders will still be shown because this feature only applies to ASAP orders. Below you can set the prep times for group orders. Here you can choose to attach a warning to orders that are for a future date/time so it is more clear without having to inspect the date on each order that comes in. Enter a value for how many minutes away from the current time you would like to mark as advance. Here you can set the minimum for orders, processing fees, delivery charges, and delivery areas. Below you can enter the minimum that must be spent to qualify for different types of orders. Note: You can also configure different minimums for different delivery distances, determined by Zip codes or miles/kilometers. You can also include a per-order processing fee if you desire. Here you can set the percent or dollar amount, name of the fee, when the fee applies, and if it is taxable. Note: Below you can also opt to use the driving distance to determine the delivery radius instead of the default "as the crow flies" method. Here you can set up your Delivery Zone, either by zip codes, miles radius, or drawing your own custom/irregularly shaped zone. After saving the info above, if you want to draw your own zone, click Create/Edit custom delivery zones to begin. Here you can begin drawing your delivery zone. Move around the map of your area using the small hand icon. The map will automatically show your location near the center. To start, select the irregular shape icon near the top to the right of the hand icon. Simply click where you would like to begin your zone and a point will be marked on the map. Click again to drop another point and a line will appear between them, as seen below. Continue dropping points until you have the shape of zone you desire. When you are done, the area will be filled with color. Note: You can make multiple zones if desired. At the top of the page you will now see your zone listed. Here you can name the zone, set the delivery rate, choose a color for the zone, or remove the zone if you would like to start again. Be sure to click Save Delivery Zones when you are done! Here you can upload a PDF of your menu, image of your delivery area, and set custom messages to be displayed during and after ordering. Here you can get the code to add a button linking to this location.